The state urban development department is confident of taking things ahead and it does not foresee any halt to the project at the present state. 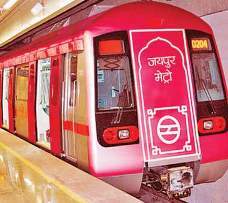 Jaipur: The Jaipur Metro Rail Corporation (JMRC) is likely to advance to the second phase of metro project. This despite the fact that the first phase is largely held as non-viable in its current format by the CAG. But that is not stopping JMRC to initiate Jaipur Metro Phase II plan. JMRC plans to go ahead with second phase with the current capacities it has. The state urban development department is confident of taking things ahead and it does not foresee any halt to the project at the present state. They are optimistic even as chance of any financial assistance from government in the centre is bleak. Additional chief secretary, urban development shared that the project cannot be halted at the moment. They have to initiative work on second phase in order to reinstate feasibility to the project. According to a report in DNA, a news portal- It has been accepted by the Jaipur Metro Rail Corporation that the DMRC has used inflated population estimates while preparing initial detailed project report of the metro. A recent report of the Comptroller and Auditor General (CAG) office has also raised an objection on the selection of the first phase for implementation. The report has suggested that JMRC must look for alternative arrangements like light rail transport for its second phase. The revenue generation for the first phase of the metro has been largely short in comparison to its operational cost. However, JMRC officials insist on the necessity of a medium-scale metro for Jaipur. A senior JMRC official states the even the latest survey with rectified population figures suggest the requirement of an additional medium-metro corridor from Sitapura to VKI. The metro officials are unwilling to implement an economic light rail transit system for the second phase. Given the fact that the arrangement for funding the project is going to be one challenging task for the government. With a nonexistence unified metropolitan transport authority, the state is not likely to get financial assistance from central government for the Jaipur metro. The state government has been trying to chase the government at the centre for a 20 per cent share in the Jaipur Metro. This process unfortunately remains pending in absence of due dealings at end of state government. Darshana Shukla is working with Metro Rail News as Associate Editor (Online) under WfH scheme. She is Freelance Correspondent for Ahmedabad Mirror. She also works as PR & Media Consultant for various media firms and well-connected to media circuits in major metro cities in India.